Neglecting your drivetrain could spell big trouble after a few years, but simple maintenance can prevent catastrophe. Propeller shafts and their accoutrements are pretty tough, but poor maintenance can shorten their life spans. 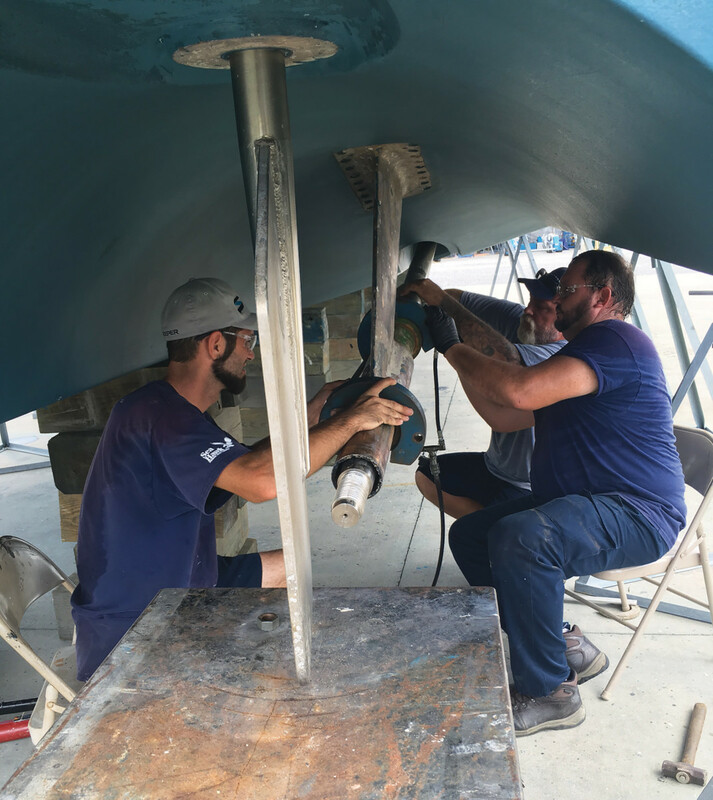 Proper rudder installation is just one component of creating an efficient drivetrain. 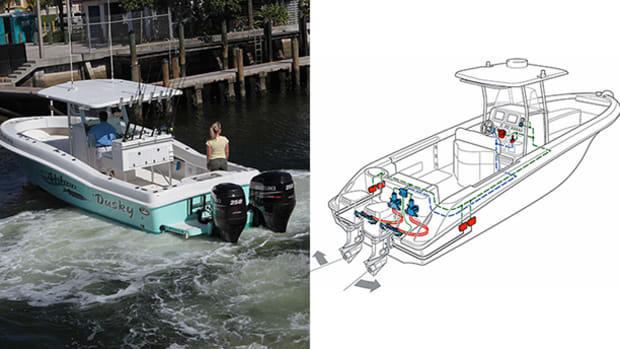 One of the easiest chores on a boat is maintaining the drivetrain, arguably the most basic, most reliable onboard system. A typical shaft-and-propeller drivetrain is comprised of simple components that last for decades and demand just basic TLC—-unless you hit something and knock things out of whack, or you want to fix something that ain’t broke. I’ll bet that, somewhere, there’s a century-old stuffing box that’s still working fine, needing only repacking every few years. If you’re a “hands-off” owner, drivetrain maintenance is just the thing. But that doesn’t mean you can completely ignore your drivetrain. 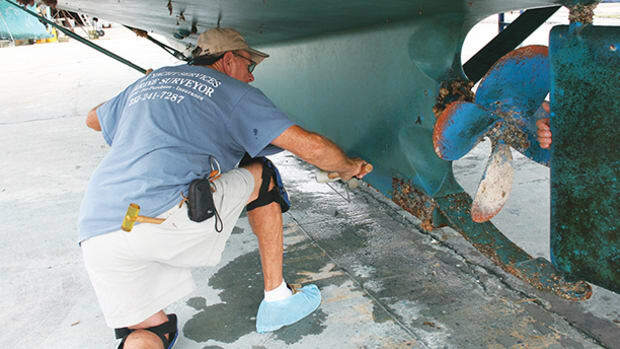 If you do, after a number of years you might find water coming in around the propeller shaft, thanks to worn-out packing or a rotted shaft-seal bellows, a situation whose consequences can range from annoying to catastrophic. While a cascade of unwanted seawater is most dramatic, there are other, more insidious, consequences of drivetrain neglect, including worn engine mounts and excessive vibration. Fortunately, it’s easy to prevent all of the above. Many experts consider the drivetrain to be the string of components between the gearbox and propeller, starting at the shaft coupling. I disagree. I say the drivetrain starts with the engine mounts. In most boats, they transfer the thrust of the propeller to the hull. 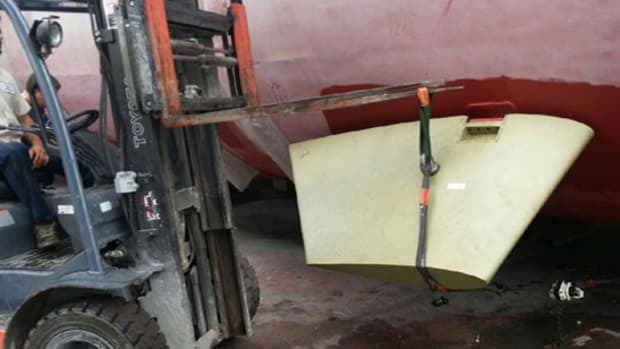 The prop pushes against the shaft, the shaft against the gearbox (there’s a thrust bearing inside), the gearbox is bolted to the engine and the engine’s attached to the boat via its mounts. A solid mount is best at -transferring prop thrust, but also transfers vibration to the hull; a super-soft mount makes for a nice ride, but lets the engine shift too much. It’s a compromise, but one with a good, albeit costly, workaround; get out your checkbook and keep reading. Propeller thrust both pushes the engine forward, against the mounts, and imparts a twisting force due to the torque of the spinning blades. 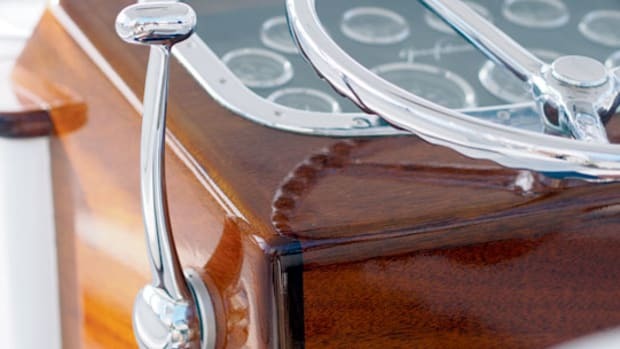 These forces gradually wear out the flexible components in the mounts. Since the engine is more often in forward gear than reverse, the twisting causes the mounts on one side to wear out sooner than the other. We’re talking years for this to happen, of course—given the light usage most yachts get, maybe a decade or more. You can’t see the wear, but if your boat starts vibrating underway, and a feeler gauge shows the shaft is properly aligned at rest, maybe one or more engine mounts has gotten soft and is letting the engine shift a bit too far under load. Time to call in an expert. If you’re buying a used boat, especially one that’s been heavily fished, or used for charter, it’s something to check, and to budget for. Check the alignment between the gearbox and shaft coupling every once in a while—how often ranges from never, if everything is running smoothly, to often, if you’ve picked up vibration underway, or your engine’s jumping around like a jack-in-the-box, or you’re wearing out Cutless bearings too often, or you’ve hit something hard enough to damage the running gear. But before pulling things apart, take a swim and check that there’s not something wrapped around the shaft. In wooden-boat days, mechanics would break the coupling before the boat was hauled, so any flexing of the hull when out of the water— common with wooden boats—wouldn’t throw things out of whack. 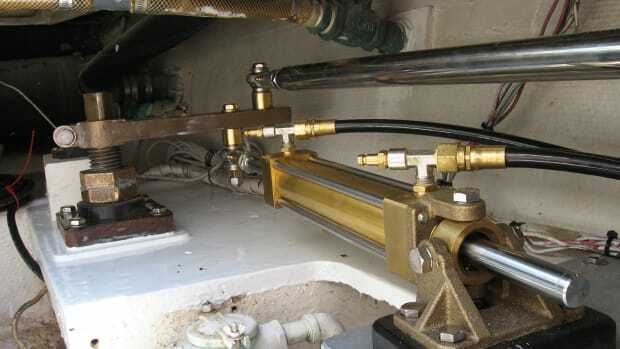 Once the boat was back overboard, the mechanic would check the alignment when reconnecting the coupling flanges. Modern fiberglass boats don’t flex much, so that precaution is seldom observed today. Although it’s still not a bad idea. Checking and adjusting alignment takes a skilled mechanic about half an hour. It involves loosening the coupling, then using a very thin feeler gauge to check that the two flanges of the coupling line up almost perfectly, side to side and top to bottom. The rule of thumb is no more than .001 inches of misalignment per inch of flange diameter. The mechanic will check the alignment, then rotate the shaft 90 degrees and check it again; changes in alignment during rotation can indicate a bent shaft. Aligning an engine involves making minor adjustments at the engine mounts, but it’s a bit like cutting all the legs of a wobbly table to the same length—before long the table’s about knee-high and the top’s still not level. It’s best left to a professional. When was the last time you inspected your shaft seals? Be honest. Many boats today have a flexible coupling between the gearbox and prop shaft; if yours doesn’t, you might want to add one. 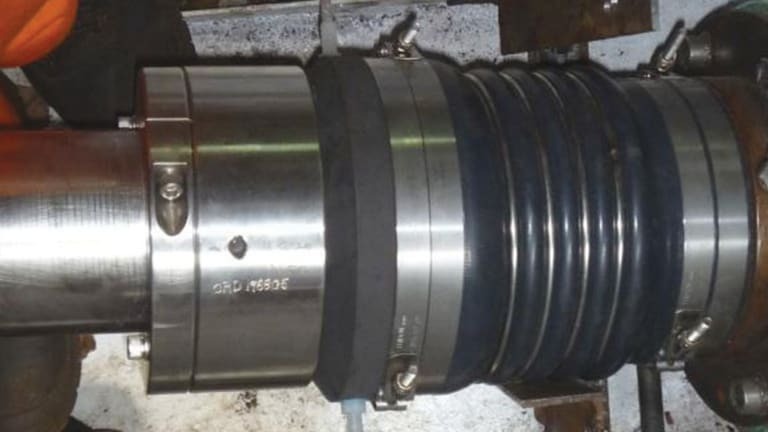 A flexible coupling—Drivesaver from Global Marine Products (gcsmarine.com) is one, but there are several other brands—can compensate for slight shaft misalignment while reducing vibration from the propeller. It’s basically a thick, hard plastic washer that fits between the halves of the shaft coupling; it’s not very flexible, really, but more flexible than a steel-on-steel connection. Sounds easy, right? In most cases it is, unless the distance the coupling shifts the prop shaft aft makes a difference. Most flex couplings are from 1- to 1.5-inches thick, depending on the coupling diameter. In some cases, the coupling moves the prop far enough aft of the strut to leave too long a span of unsupported shaft—what Naval Architect Dave Gerr calls “propeller overhang.” It’s the distance between the after side of the strut and the forward side of the propeller hub; some overhang is necessary to allow free flow of water through the Cutless bearing, but too much can cause vibration. Gerr recommends an ideal overhang of 1x shaft diameter; 1.5x is acceptable, 2x the maximum—and only if it’s unavoidable. For example, if a 2-inch shaft has a 2 inch overhang, adding the 1-inch-thick flex coupling brings the overhang to 3 inches, or 1.5x shaft diameter. Okay, but if the overhang is already 3 inches, the coupling makes it 4 inches, 2x shaft diameter, and you’re up against the maximum. To be safe, measure first, or check with your yard manager for advice. 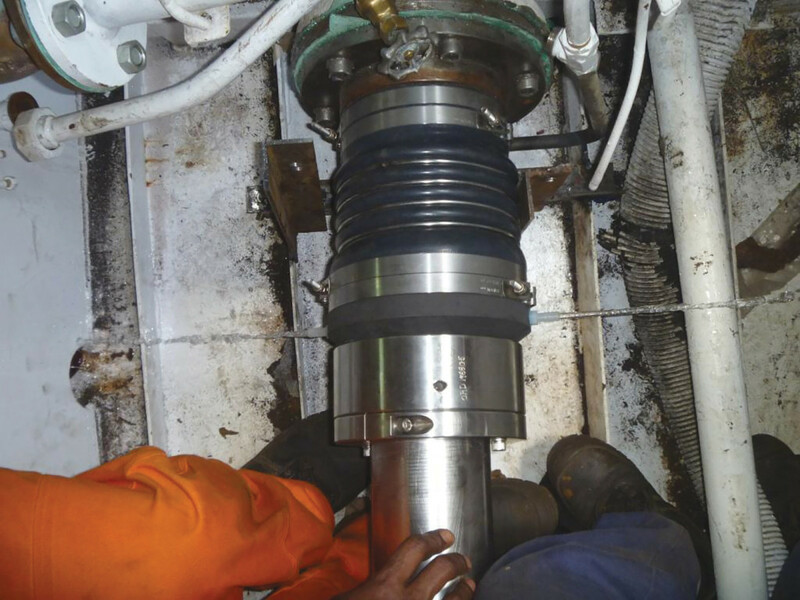 If it’s necessary to cut the shaft to compensate for the width of the flex coupling, that usually means re-machining the keyway, and the shaft, too, if it’s tapered. A simple job becomes not so simple and more expensive. Proper drivetrain alignment starts at the prop and continues all the way to your engine mounts. 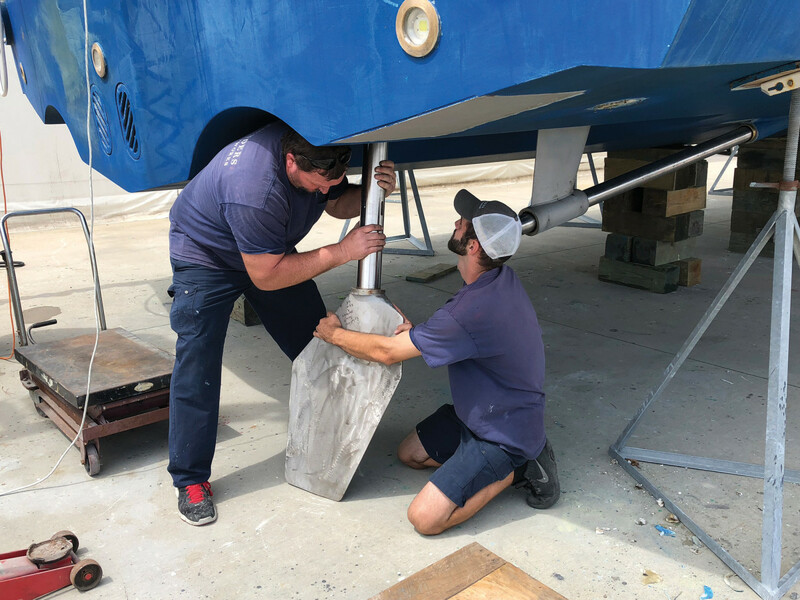 No matter what’s going on at the gearbox, the propeller shaft has to exit the hull, and that means a stuffing box or shaft seal to keep the water out. A stuffing box is basically a housing to hold watertight packing, and an adjustable compression sleeve to tamp it down around the shaft. (Stuffing box designs differ, but the principle is the same.) The stuffing box can be bolted directly to the shaft log—a “fixed” box—or mounted in a heavy hose that’s clamped to a shaft tube or a “flexible” box. 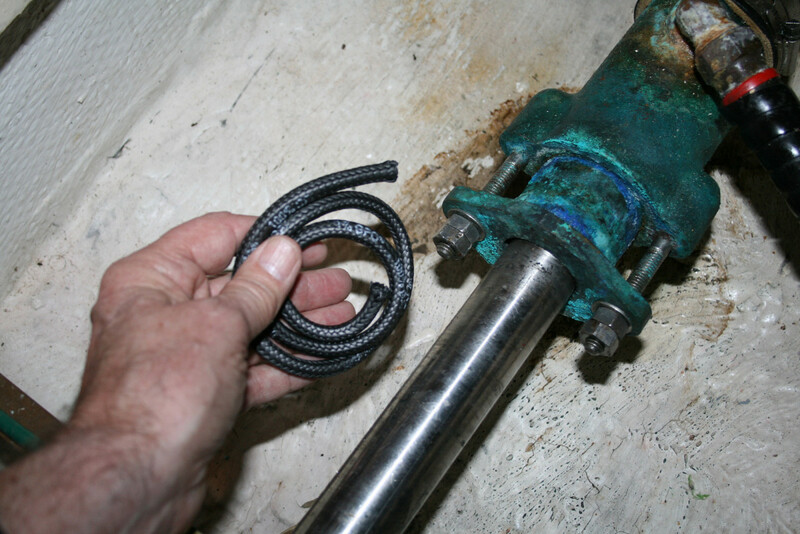 A flexible box, more common on modern boats, absorbs minor shaft misalignment, but the hose and its clamps need periodic attention; if the hose fails, lots of water will follow. A fixed box is more secure, in my opinion, but misalignment can wear out its packing quickly, and even loosen or break its fastenings, allowing water to leak in around it. 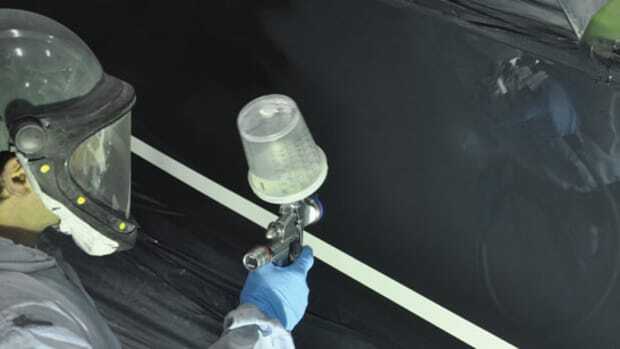 Regular inspections should prevent both issues. 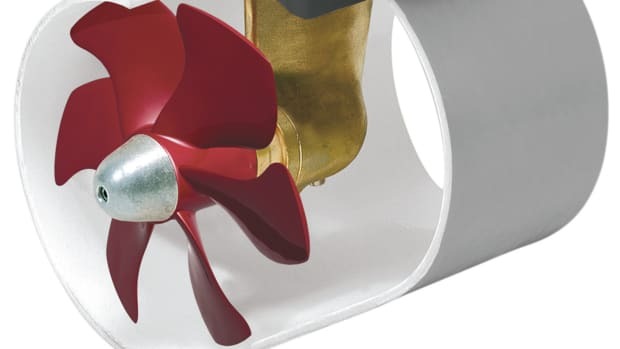 No matter the style of stuffing box, it should be adjusted so no water seeps in when the boat’s idle, but there’s an occasional drip for lubrication when the shaft’s turning. What’s “occasional?” Depends on who you ask. Some experts say two or three drops per minute, others one per minute; some say one every few minutes. I’d err on the side of more, within reason; too little water, and the shaft will soon get as hot as a pistol, which can damage it. As a young, know-it-all mate, I once repacked a stuffing box too tightly, and after about five minutes underway the shaft was so hot the water that dribbled onto it boiled away. (Good thing I checked.) Keep the area around the stuffing box/shaft seal dry and clean, so if excessive water does start leaking in, it will be easier to notice during your inspections. If water is dripping in steadily, like a leaky bathroom faucet, it’s time to tighten the gland a bit, or maybe repack it. It’s an easy, do-it-yourself job with the boat out of the water. Modern packing is made of graphite impregnated with Teflon; it looks like square braided rope. Pull out the old packing (there’s a tool for it, basically a corkscrew on a flexible stalk), then reinstall three or four separate turns of the correct size packing, staggering the joints. Push each one into place with the compression sleeve before adding the next. Finally, tighten the sleeve hand-tight, plus a bit more, and set up the locking nut. 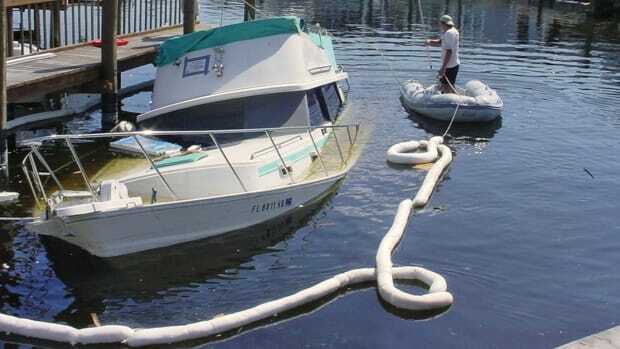 When the boat’s back in the water, check your work; if a little water shows up, that’s okay. Start the engine, measure the drips and correct accordingly. There’s a stuffing box on your rudder, too, so check it as well. Maybe it’s time to upgrade to a dripless shaft seal. It does away with the stuffing box, and the drips, and requires very little maintenance. PYI, Inc. builds a packless shaft seal that’s easy to install with the boat out of the water. The PYI shaft seal consists of a rubber bellows that fits over the shaft and clamps to the stern tube; there’s a non-rotating carbon flange attached to the bellows that makes up one-half of the seal. The other half is a rotating stainless-steel disk secured to the shaft. Pushing the disk against the flange to compress the bellows slightly, and locking it in place with set screws provides the seal. Simple so far, but vessels faster than 12 knots require a separate supply of cooling water injected via a hose barb on the carbon flange. PYI recommends tapping off an existing supply of raw water. That complicates the installation somewhat, but once it’s done, the shaft seal is a set-and-forget system, at least for a few years. PYI recommends inspecting it regularly, with a rebuild, including new bellows, every six years. Maybe I’m just getting old, but I don’t see anything wrong with a conventional, time-proven stuffing box, one that doesn’t need cooling water plumbed in. Okay, so they take a bit of maintenance, but renewing the packing is a minor job, and one most skippers won’t have to do more than every couple of seasons. Sometimes old stuff is the best.